An undergraduate team of scientists in Yale led by an Indian-American, is designing a miniature satellite which has been chosen by NASA for launch on space missions in the coming years. 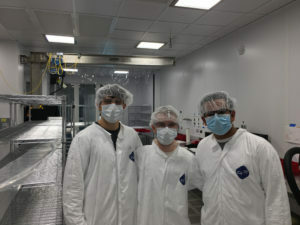 The Yale Undergraduate Aerospace Association (YUAA), which is currently led by Keshav Raghavan, is currently working at the Wright Lab to build a CubeSat research satellite to detect cosmic rays. It is among 16 teams undergraduate teams across the country whose CubeSats will be flown into space as auxiliary payloads on space missions planned to launch in 2020, 2021 and 2022. “It will be the first ever Yale undergraduate endeavor to launch a spacecraft, forging the path for even more ambitious space-based projects by Yale undergraduates in the future,” the University announced in a March 22, press release. To date, the CubeSat Launch Initiative has selected 176 CubeSat missions from 39 states and launched 85 CubeSat missions as part of the Educational Launch of Nanosatellites (ELaNa) through NASA’s Launch Services Program, NASA said in its press release. Raghavan and his team mates have already done the research and development work on the miniature satellite, and this summer, they begin on prototyping and final construction work on the satellite. In January 2019, the team began using one of Wright Lab’s clean rooms to conduct tests on launch-ready components, such as the altitude control systems, Yale said in its press release. Wright Lab will be the team’s site for final assembly of the satellite. According to the YUAA website, these miniature satellites were first developed by the California Polytechnic State University and Stanford University in 1999. “Intended as a standard, inexpensive design that can easily fit alongside larger satellites aboard launch vehicles, the CubeSat model has given student groups, hobbyist organizations, and research teams operating with limited funding or experience unprecedented access to space,” the YUAA site says. These miniature satellites are built from commercially available materials and have a modular structure of 10x10x10cm cubes (hence the name). Hundreds of universities, companies and research teams have designed and launched their own CubeSats over the years. The Yale CubeSat project is an undergraduate-run project, currently in its 4th year.